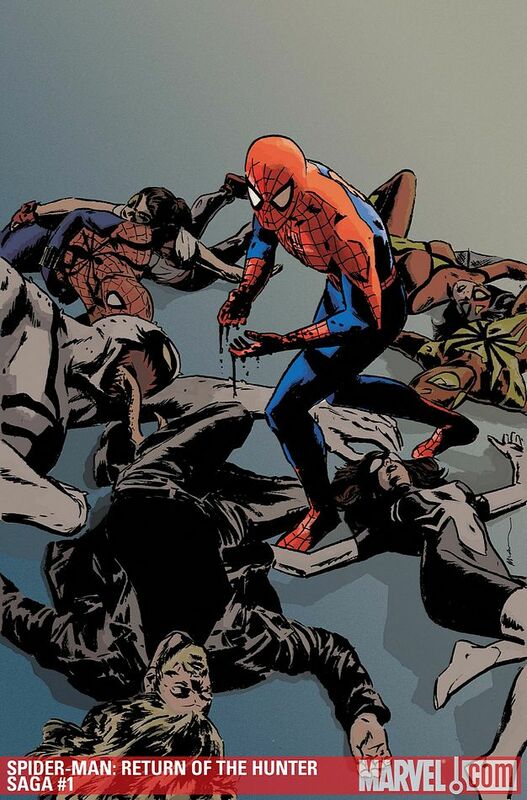 No, you didn't miss the upcoming "Grim Hunt" Amazing Spider-Man issues. This isn't a post about the trade, rather it is a post about the free "catch you up" issue Marvel has been giving out to comic shop frequenter to grow intererst in the upcoming Spider-Man event. Included in many Amazing Spider-Man issues over the past year has been little segments featuring the late Kraven the Hunter's family (his wife and daughter) as they recruit classic Spidey enemies to do what readers all assume is take down the webslinger. The return of Kraven himself even seems likely with the rate that comic characters come back to life these days. Dead? Yes. Kraven has been dead for quite some time. 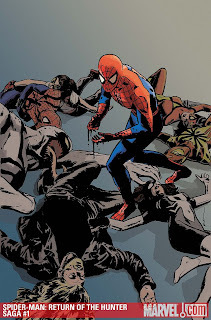 Marvel is aware that many new readers or even casual readers may not be aware of the early Spidey rogue gallery member, so the decided to produce The Amazing Spider-Man: Grim Hunt - The Kraven Saga. The Kraven Saga includes the origin, life, death and happening after Kraven's death in snap shots of key moments. We relearn Kraven's motives and connections which should give us understanding behind why this event is important. I have written about these "catch you up" books before, and I do again because I feel they are both a great tool for Marvel to produce sales and great reminder to the readers about where the specific story is and how it got there. Marvel wisely throws these free books at shoppers hoping to spark some interest in the event. If Marvel can get just a few readers to check out the issues hitting stands in the future, Marvel can potentially hook a reader into several issues...possibly beyond the event being highlighted. For a reader, the "catch you up" books are simple cherries on our already exciting Wednesday's sundaes. An extra book to read once we get to the bottom of our dwindled stack. The Amazing Spider-Man: Grim Hunt - The Kraven Saga came out with great timing for me because all I got this week was the newest Daredevil issue. Thank you Marvel for providing an extra comic of the day to keep me busy for 10 more minutes!